Researchers have long debated how and what our ancestors ate. Charles Darwin hypothesized that the hunting of game animals was a defining feature of early hominids, one that was linked with both upright walking and advanced tool use and that isolated these species from their closest relatives (such as ancestors of chimpanzees); modified versions of this hypothesis exist to this day. 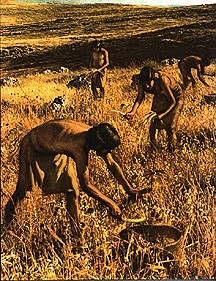 Other scholars insist that while our ancestors' diets did include meat, it was predominantly scavenged and not hunted. Still others argue that particular plant foods such as roots and tubers were of greater importance than meat in the diets of these species. Research technology has come a long way since Darwin's time, making possible the kind of analysis early scholars could only have imagined. Recent work has presented reconstructions of early hominid diets on the basis of chemical makeups of fossil tooth enamel, evidence of microscopic wear on teeth, and advanced studies of craniodental anatomy, to name a few. However, according to Ken Sayers (Georgia State University) and C. Owen Lovejoy (Kent State University) in an article published in the December 2014 issue of The Quarterly Review of Biology, although modern-day technology provides valuable insight, such tools alone cannot provide a complete picture of the diet of early hominids. Instead, they should be included -- alongside other methodologies -- in holistic studies grounded in the fundamentals of modern evolutionary ecology. Sayers and Lovejoy suggest that researchers should examine a species' particular habitat and "whole-body" anatomy, including digestion, locomotion, and possible cognitive abilities. In particular, foraging theory -- a branch of evolutionary ecology that investigates animal feeding decisions through the lens of efficiency principles -- is especially important to consider, as it demonstrates that diet is regulated by the potential value and costs of exploiting individual food items (whether plant, animal, or other) and by the relative abundance of the most profitable foods. In the case of the earliest-known hominids, evidence about their morphology and likely cognitive abilities -- in addition to data obtained from modern technologies -- provide little support for a reliance on any one particular food type. Rather, these species likely had a broadly omnivorous diet that became increasingly generalized over time. According to Sayers and Lovejoy, the early hominid diet can best be elucidated by considering the entire habitat-specific resource base and by quantifying the potential profitability and abundance of likely available foods. Furthermore, they warn that hypotheses focusing too narrowly on any one food type or foraging strategy -- such as hunting or scavenging or any one particular plant category -- are too restrictive and should be viewed with caution. Modeling these species' diets instead "requires a holistic, interdisciplinary approach that goes beyond merely what we can observe chemically or through a microscope, and draws from ecology, anatomy and physiology, cognitive science, and behavior."